Full length native protein from human erythrocytes. This antibody gave a positive signal in the following whole cell lysates: HeLa; NIH3T3. 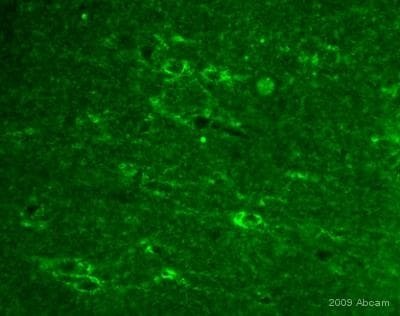 This antibody also gave a positive signal in Human brain tissue lysate. Our Abpromise guarantee covers the use of ab9483 in the following tested applications. WB 1/1000. Detects a band of approximately 37 kDa (predicted molecular weight: 35.8 kDa). ICC/IF image of ab9483 stained HepG2 cells. The cells were 4% PFA fixed (10 min) and then incubated in 1%BSA / 10% normal donkey serum / 0.3M glycine in 0.1% PBS-Tween for 1h to permeabilise the cells and block non-specific protein-protein interactions. The cells were then incubated with the antibody (ab9483, 1µg/ml) overnight at +4°C. 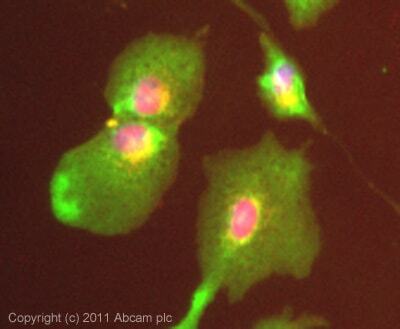 The secondary antibody (green) was Alexa Fluor® 488 donkey anti-goat IgG (H+L) used at a 1/1000 dilution for 1h. Alexa Fluor® 594 WGA was used to label plasma membranes (red) at a 1/200 dilution for 1h. DAPI was used to stain the cell nuclei (blue) at a concentration of 1.43µM. 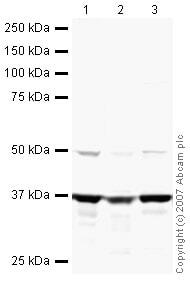 This antibody also gave a positive result in 4% PFA fixed (10 min) HeLa cells at 1µg/ml. ab9483 staining GAPDH in HeLa by ICC/IF (Immunocytochemistry/immunofluorescence). Cells were fixed with paraformaldehydeand. Samples were incubated with primary antibody (1/200) for 30 minutes. An undiluted Alexa Fluor® 568-conjugated Donkey anti-goat polyclonal was used as the secondary antibody. Publishing research using ab9483? Please let us know so that we can cite the reference in this datasheet.